I'm really missing being able to filter items by category in the backoffice. How is everyone circumventing this lacking feature ? When editing several products, I've found that the product import/export tool works best. By exporting to a csv, you can then filter by category and make the edits where necessary. As Michael mentioned the export -> Import option would be the best if you are updating many products at once. If you want to remove multiple products from a specific category page you can go to: Products -> Categories -> Click a category and scroll down to "Manage Products". We have a feature request in regards to adding the Category filter to the Products page. I will create a support ticket and link it to this feature request. Unfortunately, the import feature is way too limiting to be any kind of useful to us in that regards. As for the Manage Products section, I haven't found it useful at all and it is very clunky. If at least it'd let you select multiple products and add them to a category all at once, I guess it could be somewhat useful. Can you explain what you are trying to do? maybe we can find a better workaround. I'm trying to see all the products in a category at once so that I can make targeted changes. It's just as simple as that. Editing all the products in a category to change the image, description, price, tags, filters, custom data, etc. Basically any time we have a sale or we want to implement a new feature on our site, we'll want to revisit all the items in a category. The current ways of remembering by heart all the items in a category, looking them up on the website/export so that we can type them one by one in the filter and edit them or going through the entire product list only clicking on the products we know are in a category don't cut it. Just making it so that in your category management tool (Category -> Manage Products), we can click on a product's name to open a new page to that product's page would be a perfect MVP, and I'm sure it wouldn't take much time. The tool needs to have its peformance improved however, because right now it's extremely laggy. It's much easier to manage your products if you can manage them in smaller segments. FYI, Lightspeed is the only eCommerce platform I know that doesn't have this feature (and I've used at least a dozen). "The current ways of remembering by heart all the items in a category, looking them up on the website/export so that we can type them one by one in the filter and edit them or going through the entire product list only clicking on the products we know are in a category don't cut it." This is actually one way that the import tool is pretty helpful, since to see all the products in a category, you would just sort the category columns alphabetically. 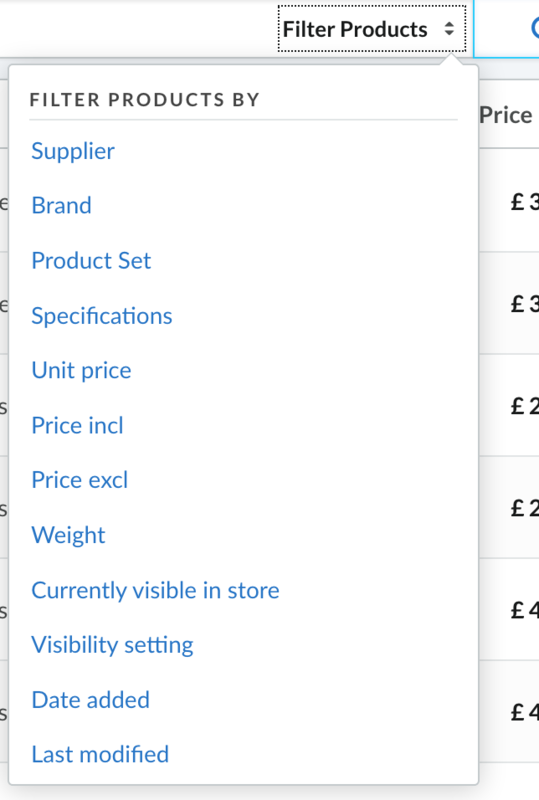 Then you wouldn't need to have to remember which products belong to which category, and you can bulk edit those on the list. I know you mentioned that the import tool is not ideal for what you're hoping to do, so I'm sure this doesn't solve the issue. Just wanted to offer my two cents on that piece in particular. Forgive the intrusion, as our companies use LS Retail integrated with Shopify. So I haven't done more than just test a bit of LS E-com. But I'm wondering @yvigeant, are you using LS Retail in tandem with LS E-com? If so, wouldn't the categories sync up between the two? In that you could perhaps better manage and maintain the categories in LS Retail, and any changes would push into LS E-com? Here's our reference for field mapping between Onsite/Retail/eCom/Shopify and what does / does not sync. Some of these mappings can be changed by the user and for what connector you're using for Shopify. This is helpful, in terms of translating the different field names between the various systems. We internally developed our Shopify connector with LS Retail and so far it's pretty seamless. Since we have total control over what we need to map between the two systems for integration purposes. My question is what fields integrate "out of the box" between LS Retail and LS E-com? For example, based on my testing I'm not seeing Images, Categories, Tags, etc. syncing up by default. If LS has a true omni-channel solution then one would assume that a vast majority of these product fieds would indeed integrate without requiring manual import/export operations, right? And yes, Lightspeed is not a true omni-channel solution in that regards. You have to create the item in Retail and redo most of the work again in eCom (images, tags, prices, they even had a Description field in Retail that did not sync with eCom (it has been renamed to Notes since)). A lot of our work ends up being duplicated when creating or updating an item. Indeed, the export tool can filter things for you and then you can type the items one by one in eCom to modify them as you'd like. You can also use Retail's filters to do that without using the export tool. I think we can all agree that this is a very sub optimal solution. Also, since product descriptions contain complex strings (html) that often contain delimiters like comas and semi-comas (which coincidentally are the only ones allowed by eCom), the export tool is unusable for the products export and can only be used for the inventory export. If you have to use the import/export tool for something like that, it's because the actual product is not complete yet in my opinion. Indeed, the export tool can filter things for you and then you can type the items one by one in eCom to modify them as you'd like. Just to clarify, once you have the products filtered in a spreadsheet you can add, for example, the "Boxing Day" category. Then import the spreadsheet back into eCom and the categories are added to the product (original categories are not removed). You can import data back into eCom without clicking each product in eCom. Just note, you can not make changes to fields that are controlled by Retail, like Stock, Brand and Sell Price. But you can import Tags, Descriptions, Meta info, Images, etc. The Product Content field can also be exported and imported with the HTML, regardless if it has comma's, quotes or periods. I made an FAQ about imports in case you want more information on Imports. Are you saying that if I replace my category in the csv by a new one, it will never remove it from the old one and only add to the new ones ? That there is absolutely no way to remove an item from a category using the import tool ? Regarding the html, Lightspeed only allows for 2 delimiters: commas and semi-commas. HTML frequently uses both of these delimiters inside its code (and commas are frequently used inside text and descriptions). 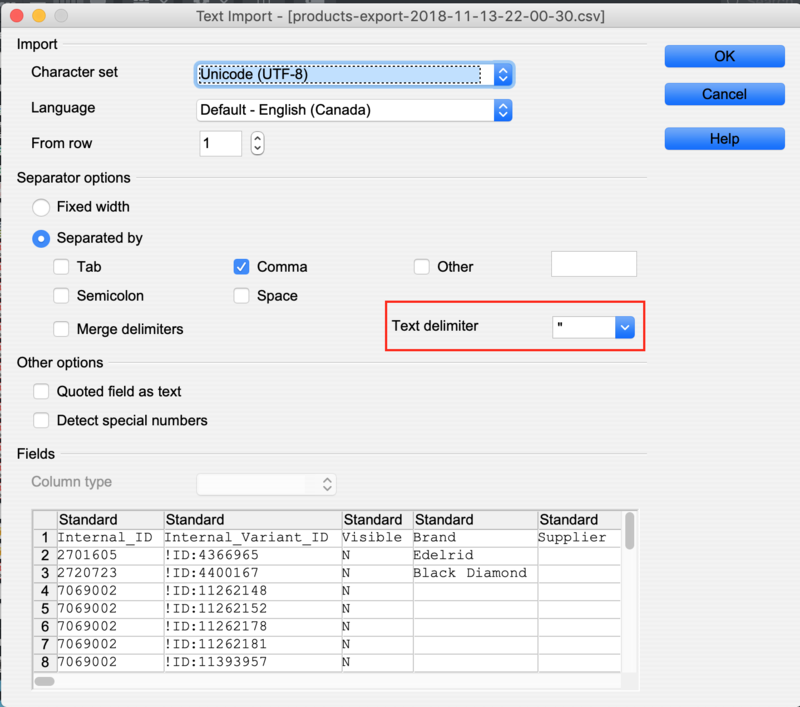 This means that if you export your products to a csv, the html content of the description will break the csv. Each , or ; on a line will create a new "column". So you'll end up with varying number of fields on each line. Same thing if you want to import html code, the import will fail since it won't understand what you are trying to import. As far as I know, the only way around this is to use other delimiters (such as pipes), which is not possible in lightspeed, and even that could still break. Also, for some reason, eCom exports each line break within the descriptions as new lines, so it completely messes up the export. The software itself will automatically take care of the text delimiters and even with the HTML it will import just fine. LS should add categories to the filter set within ecom Products. It would be really very useful. I've already tried this with both Excel and Google sheets and it doesn't seem to work. How do I make it work with standard programs ?